Info "Blow that smell over here." Aromatherapy is one of Dr. Crygor's microgames in WarioWare: Twisted! The game's purpose is to direct the scents from the food or candle into a man's nose, or in the latter case, a fly. To do so, the player has to tilt the Game Boy Advance to make the smells change their direction. 1st level difficulty: One scent is to be directed to the man's nose. 2nd level difficulty: Two scents are to be directed to the man's nose. 3rd level difficulty: There is a candle. 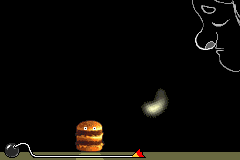 The player has to move its scent until it reaches the flying bug, paralyzing it. This page was last edited on September 26, 2018, at 23:28.